LOVINGTON, N.M. – The Lea County Fair board is always looking for ways to make its event the best it can be. It’s been home to a world-class rodeo for a long time, and it’s just getting better for this year’s event, set for 7:30 p.m. Wednesday, Aug. 10-Saturday, Aug. 13, at Jake McClure Arena. That includes the return of decorated rodeo entertainer John Harrison, who also will be part of the Lea County Xtreme Bulls event that begins at 7:30 p.m. Tuesday, Aug. 9. “Not only his barrelman credentials, but he also has the ability to put on first-class specialty acts,” rodeo chairman Kenyon Burns said, noting that Harrison has twice worked the Wrangler National Finals Rodeo. “He’s also been able to perform at the NFR as a trick rider, so he’s quite capable of doing a lot of things for our rodeo. Both aspects of Harrison’s persona are something he enjoys, and he takes great pride in having served as the NFR barrelman in 2013 and ’15. 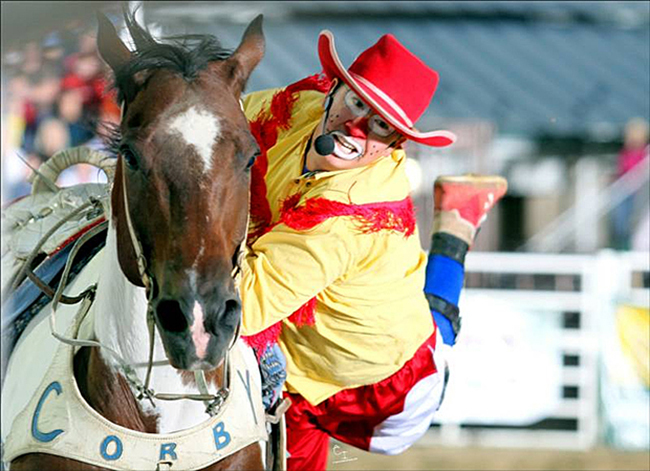 Over the last two years was recognized as the Professional Rodeo Cowboys Association’s Comedy Act of the Year. In addition to hysterical acts that showcase Harrison’s talent and athleticism, the Oklahoma man serves as a valuable piece of the puzzle that helps make for a near-flawless performance each time he speaks. That’s the key reaching fans with a variety of entertaining items. Whether it’s a trick riding display that will leave fans in awe or his parody of rodeo queens, Harrison has a lot of ammunition in his bag. It also is attractive for rodeo fans in southeastern New Mexico. Harrison returns to Lovington after having been part of the festivities in 2013.